Created Parts of a Leaf Project for Kids! In many locations, fall leaves are just beginning to reveal their beautiful colors. 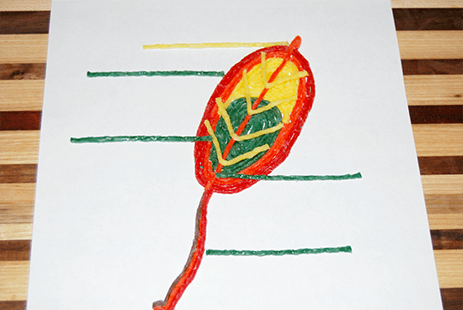 Invite your own kids to learn about the parts of a leaf with a simple leaf project created with Wikki Stix. Hands-on creation and play makes learning stick for kids. Gather your Wikki Stix for an educational and fun leaf project this fall (or anytime of the year)! There are 5 main parts to most leaves. Each of the parts of a leaf serve a specific purpose for the leaf. The blade is the flat part of the leaf where photosynthesis occurs. 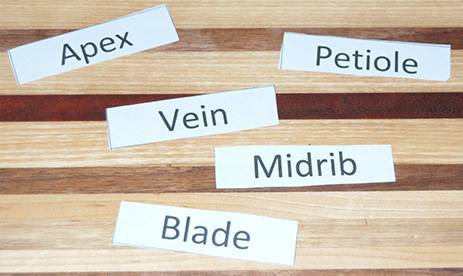 There are various shapes and sizes of leaf blades with different edges and vein patterns. The midrib is a thick vein in the leaf that runs from the apex (tip of the leaf) to the base of the leaf. The midrib provides support for the leaf and transports food, minerals, and water to the leaf. The veins shooting off of the midrib of the leaf also provide transport for necessary nutrients, food, and water for the leaf. The petiole (stem) of the leaf connects to the blade of the leaf and transports water and carries food the leaf has made. The petiole is flexible and supports the leaf during weather events so the leaf isn’t damaged. The apex is the very tip of the leaf (opposite of the petiole). The apexes of leaves vary and help provide valuable information when identifying trees and plants. 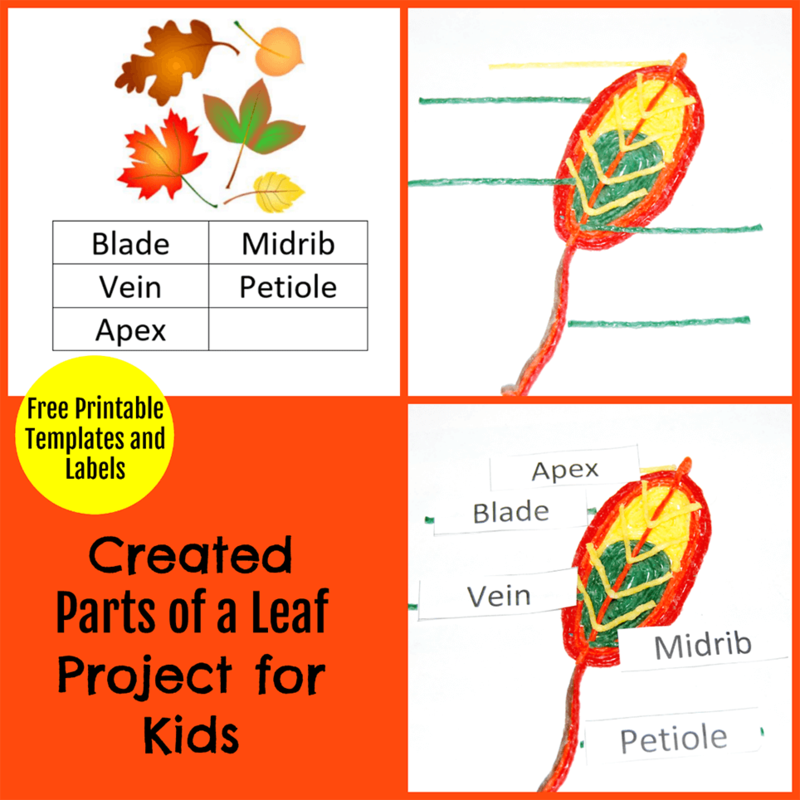 Print the parts of a leaf labels and template (one for each child). Laminate the labels and leaf template for durability. After discussion of the parts of a leaf, have kids cut out each of the labels on the first page and set aside. Using assorted leaf colors of Wikki Stix, kids can create their own leaf using the template as a guide (second page of the printable file). 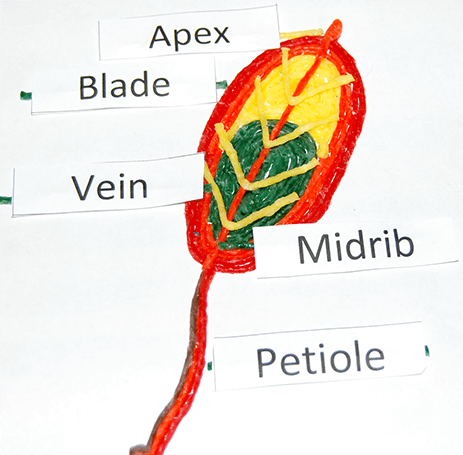 Kids can use Wikki Stix to place the labels in the corresponding areas of their created leaf (see photo). 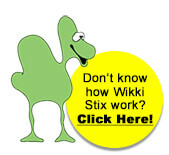 Wikki Stix is tacky and will adhere the labels to the template with fingertip pressure. Kids can remove the created leaf and re-design the leaf for future practice with parts of a leaf and labeling. The Wikki Stix created parts of a leaf projects encourage playful learning and fine motor skill at home or in the classroom any time of the year.